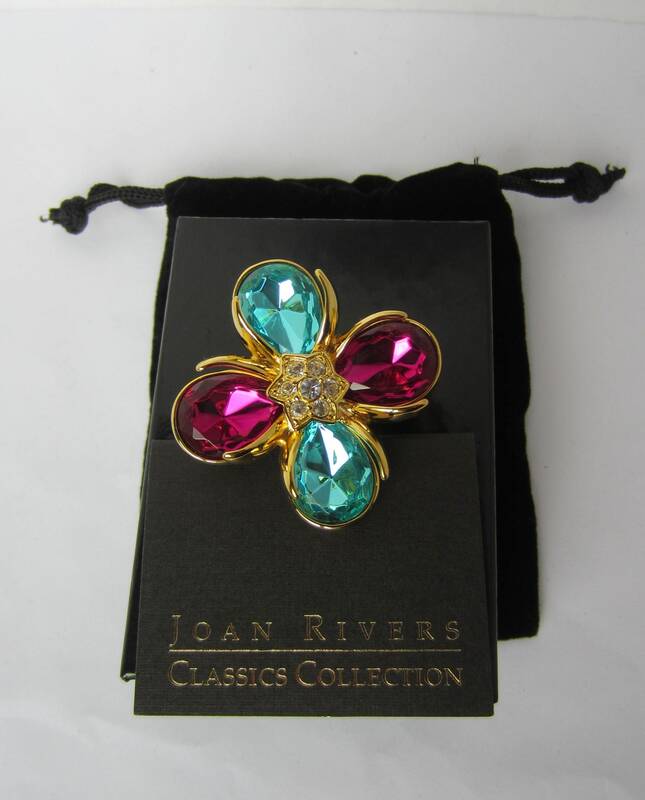 *LISTING: This is an eye-catching Maltese Cross pin from the Joan Rivers’ collection. 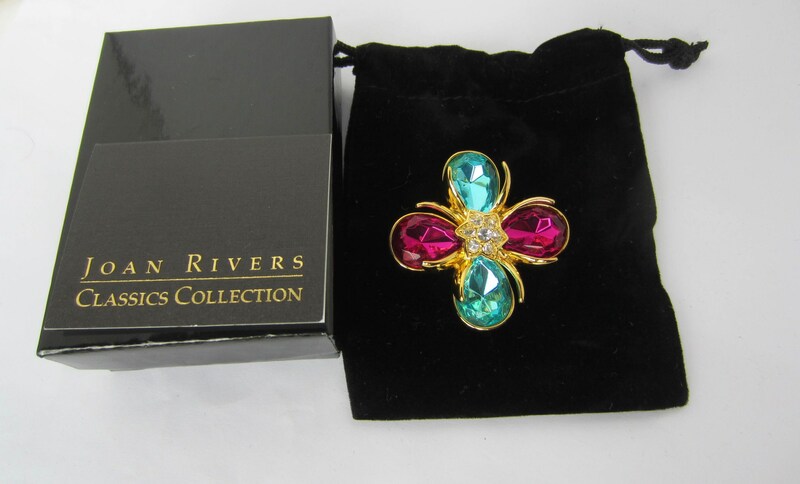 The pear/tear drop shaped AQUA & FUCSIA Swarovski crystals dazzle. 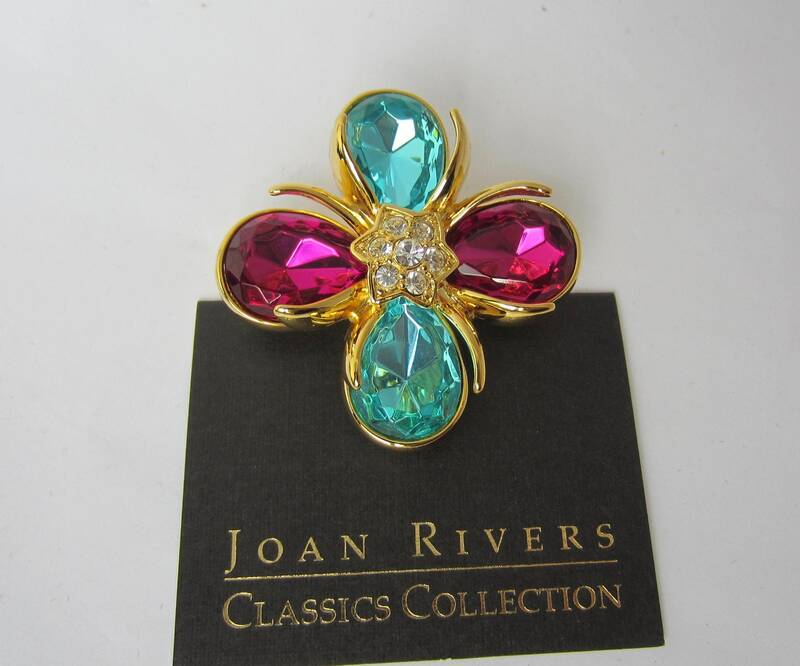 In the center are delicate, faceted clear crystals. 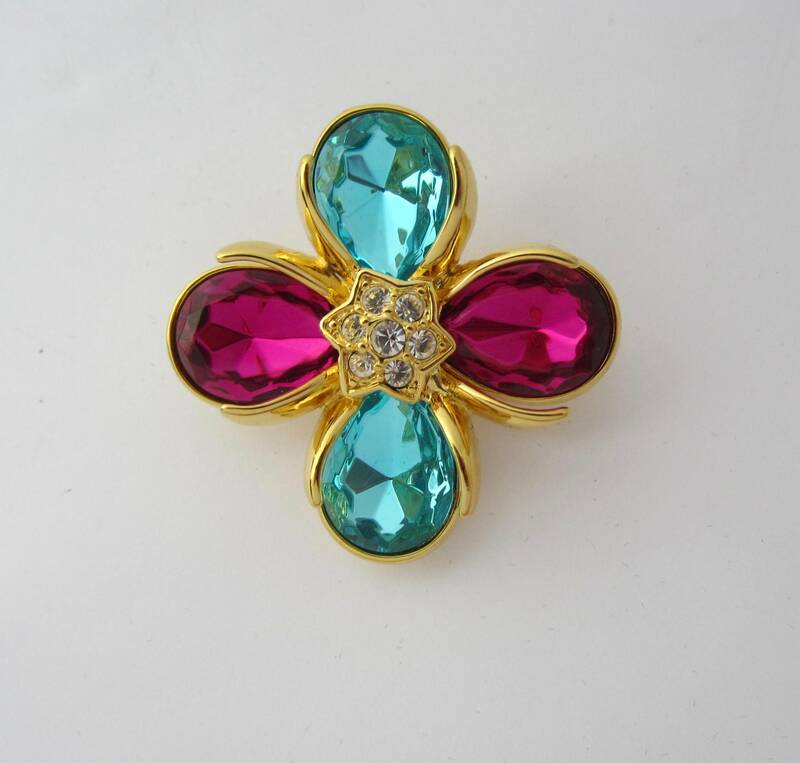 The pin looks like a flower with jutting gold tone tendrils surrounding the aqua & fuchsia crystals. 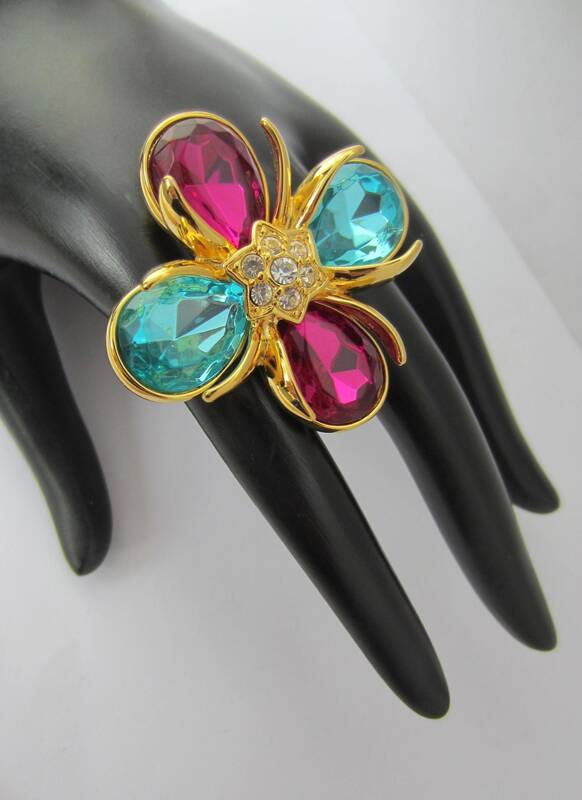 The crystals are set into high polished, gold tone metal. The pin's reverse is texturized. 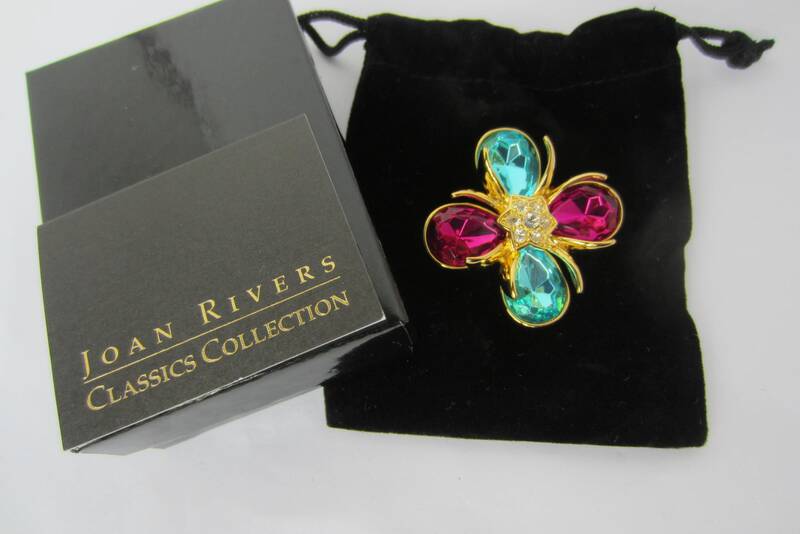 Pretty pin with the original black velvet pouch, Romance card, & box. All stones are present and sparkle brilliantly. 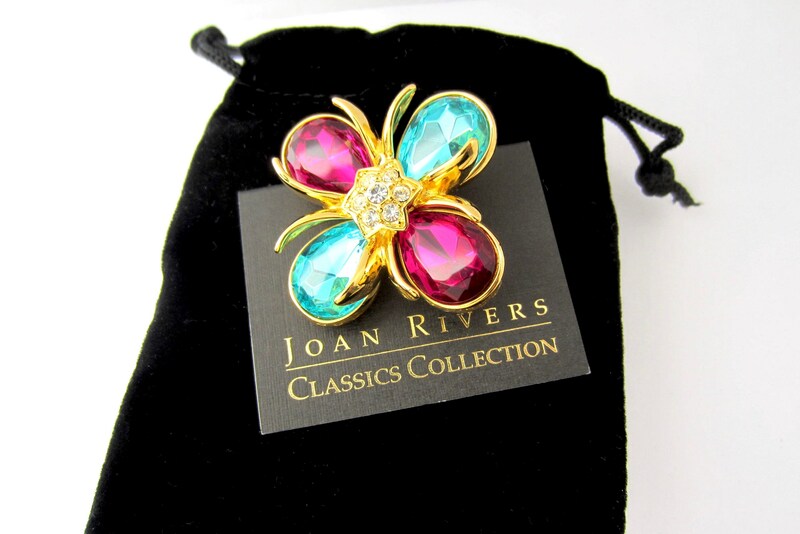 The roll-over pin clasp holds tightly. Please dive into the photos for yourself. Keep in mind that unless stated, these are VINTAGE pieces. Superficial wear should be expected. Also, I gently clean ALL pieces but leave deeper cleaning to the buyer’s discretion. HAVE QUESTIONS? NEED more PHOTOS? Don’t see what you’re looking for? EMAIL me. 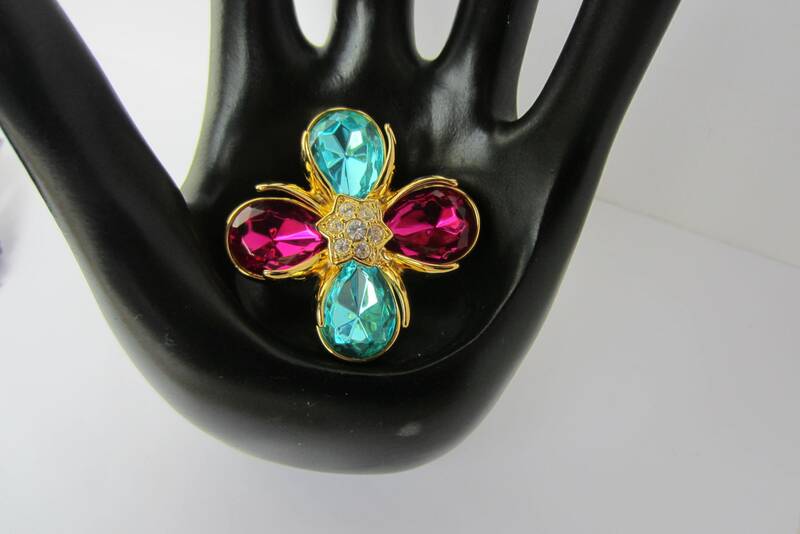 If you have a moment, enjoy my other offerings including several BAKELITE pieces in a wide range of colors and styles. THANK YOU for looking into CHEFSGIRLFRIEND. COMBINED SHIPPING: I DO combine shipping at a LOW COST to YOU. After you pay regular shipping for your first piece, each additional piece purchased on the same invoice will be only 50 cents/piece (within the U.S.). I ship within the U.S., to Canada, Europe (specifically, the United Kingdom, Austria, Belgium, Denmark, France, Germany, Liechtenstein, The Netherlands, Norway, Portugal, Spain, Sweden, Switzerland), as well as Australia & New Zealand, SINGAPORE & HONG KONG. I take GREAT PRIDE in PACKAGING your purchase(s): I treat the piece(s) like I would want my purchase(s) shipped to me, carefully wrapped & boxed. The pieces are mailed first-class USPS + tracking/confirmation #. Please see COMBINED SHIPPING under "Payment Policy" section. If you return an item, you must cover the return shipping cost including a confirmation/tracking # and in the original box/packaging within 7 days of arrival to your home. Upon my receipt of the returned piece(s), I will REFUND your ENTIRE purchase price INCLUDING the original S&H. 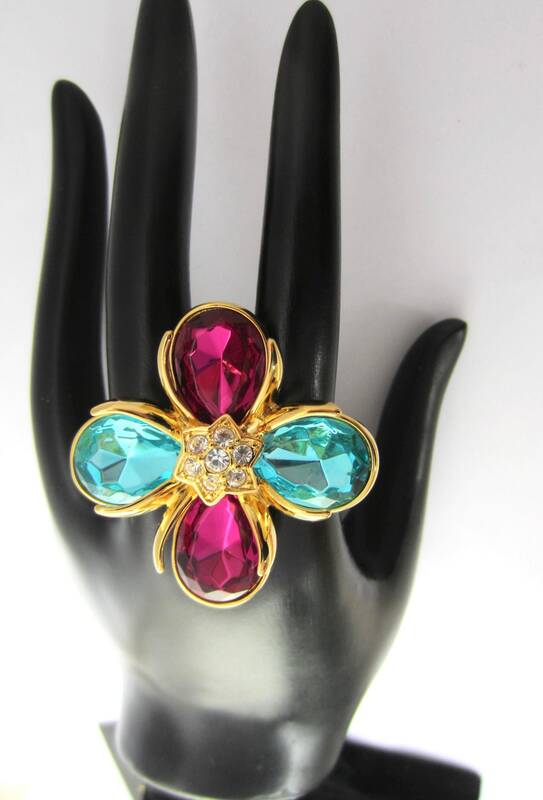 Please purchase with the knowledge that I am NOT a jewelry expert/dealer. 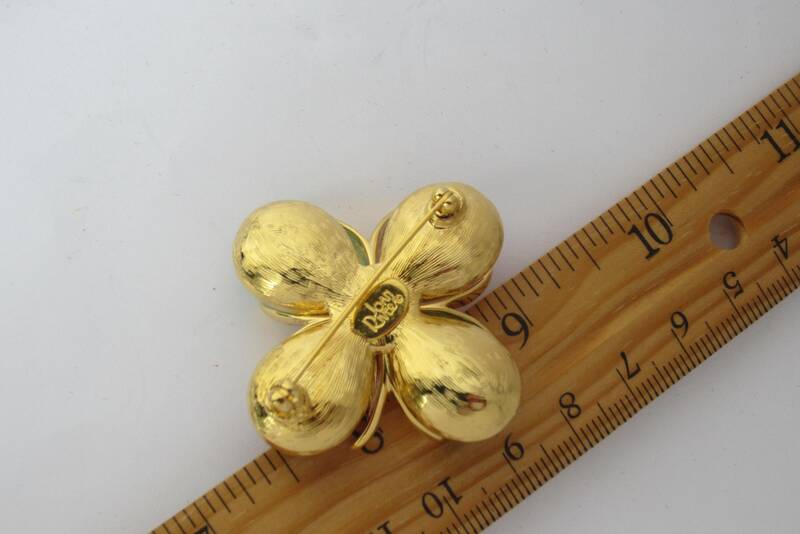 I earnestly tried to describe the jewelry to the best of my knowledge through words, photos, approximate measurements, & stone sizes/gm weights. The pieces are from my personal collection purchased new and vintage. Unless indicated, the pieces have been previously loved, so normal wear is expected. THANK YOU FOR LOOKING IN at chefsgirlfriend !